2018 is a very special year for the Navigators of South Africa. It marks 30 years since Bob and Connie Turner and their four daughters came to South Africa to pioneer the Navigators Ministry. 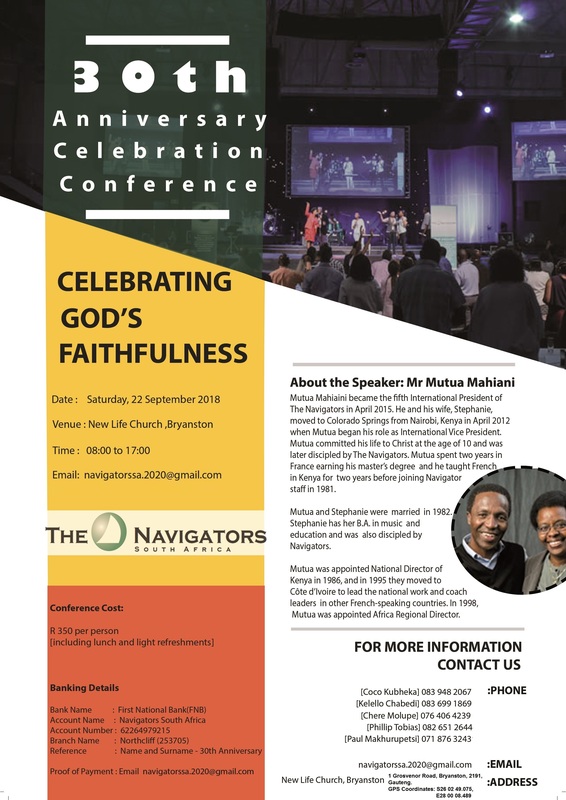 So, on 22 September 2018, from 8 AM to 5 PM, we will have a 30th Anniversary Conference in Bryanston to celebrate God’s faithfulness. Please mark the date and be there with us. Bob and Connie will be there from the USA. Bernie and Nancy Marshall will be there from Canada. Bernie and Nancy Marshall were the crucial link for Bob and Connie with the first group of students from Wits University. The cost of the conference is only R350 per person. The cost includes lunch and light refreshments for the day.